Here at Cliff Kapson Consulting, Ltd., we have been offering consulting and inspection services for over 20 years. 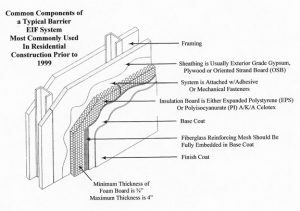 Our experience as a commercial building inspector has brought us into contact with a variety of materials and buildings to inspect, but we specialize in EIFS (Dryvit), stone, brick composite board, and stucco. We focus on exterior envelopes and our commercial property inspection services are available anywhere in the United States. If you need the services of a commercial building inspector or if you have any questions about the scope of our services, gives us a call today at 888-304-3437. You can also get in touch with us by completing the contact form located on this page and we will get back to you as soon as possible. The commercial building inspectors here at Cliff Kapson understand that each material requires a different inspection method with different protocols to adhere to. We conduct two different levels of inspection depending on the material. A first level inspection is specifically a visual observation of the exterior and we are looking for mold, mildew, and staining on the service. We also look for cracks in material like Stucco. To learn more about our commercial building inspection services or if you have any questions about our inspection processes and protocols, call us at 888-304-3437 today. Or you can simply fill out the contact form on this page and we will respond shortly.